If the image refuses to load, click on http://www.mystery.com/lj/mrs_sweetpeach/just4fun/2017/project52_2017_week_42.jpg to open it in another tab. It took me several weeks to get everything together for the gathering of Rosies took a couple of weeks. The clothing was easy as he shirt and pants were available through Amazon Prime. The replica Westinghouse Employee badge came through etsy, and the dollar store sells red lipstick. When I applied it for the costume trial run last Friday I discovered that it has been so long since I last wore lipstick that I couldn't remember how to apply it neatly. The bandana was the trickiest part of costume as the Guinness World Record people are picky. The cloth had to be red with white polka dots (white fabric with red dots would not do) and the dots had to be dime sized or a little larger. Tiny dots and large dots were both verboten. The Willow Run museum sells bandanas but I knew I wouldn't be out that way beforehand, so jebra picked some up for me at JoAnn Fabrics and I looked online for instructions on how to hand-stitch a blind hem. By the time I'd stitched the fourth side of my first bandana I was no longer horrible at blind stitching and I was satisfied by how it looked. The bandana, however, was too small for me to wear on my head. Fortunately, jebra brought home two yards of the fabric so I made a second larger version. 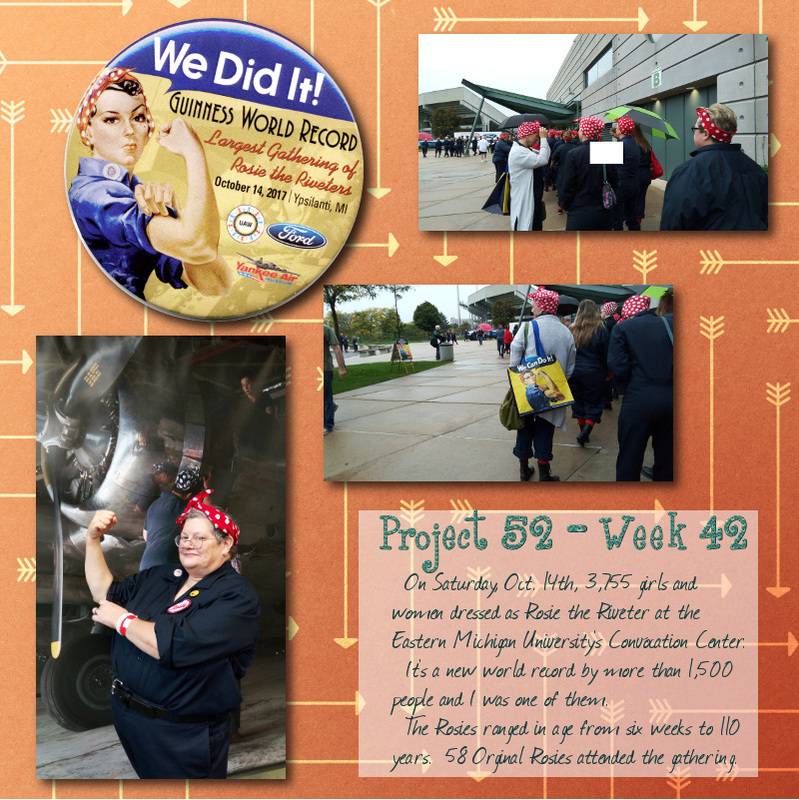 If you want to read more about the Rosie the Riveter Gathering, check out this article on ClickOn Detroit or this one from The Detroit Free Press. The articles are most useful for the photo galleries; in following media reports I noticed no one publisher got everything right. For example, one reported the youngest Rosie was six months old. That's wrong, she was six weeks. I know because I was standing next to a mother holding her seven week old Rosie when she told her mother that a six week old baby had just been checked in. I learned it takes a long time for 3,775 women to be counted accurately (the folks from Guinness take their job seriously) and that when that many Rosies raise their voices in song they sound wonderful. We sang a handful of patriotic songs, The Star-Spangled Banner, America the Beautiful, America – My country, ’tis of Thee, and a few others. I also learned that while it takes a good couple of hours to enter the arena during the official count, it takes less than 15 minutes for everyone to exit. If we need to reclaim the World Record, I will come out again even though I went home exhausted. I work a desk job and I am not used to being on my feet for three or four hours (particularly when it involves just standing around). My group was among the last to be seated and I was so tired I had trouble getting up the stairs to the second floor; my Doc Martens boots are heavy and with my left foot dropping the way it does I couldn't lift it high enough to clear each step. Somehow I dragged myself up there (thank goodness for handrails!) and took the nearest empty seat I could find. jebra found me outside in front of the building after we were dismissed, took me out for lunch, and then brought me home where I collapsed on the couch for the remainder the afternoon. I recovered enough to do my daily minimum of one hour of biking, took a shower, and fell into bed. In health news, I have developed a floater in my right eye. At least I assume it is a floater; at first I thought it was an ocular migraine but after googling a floater seemed to fit the description better. What I'm seeing is a shape that half looks like a spider hanging from a thread and half like a messy knot of thread hanging down in front of my right eye. I think it's been there longer than I thought (I noticed it specifically last Friday afternoon) because for a couple of weeks I kept thinking I'd seen an occasional spider swing down from the ceiling by my computer monitor). I could never find culprit when I'd look up or around the surface of my desk (which is so messy an army of spiders could be hiding and I'd never know). In other health news, I had my flu shot yesterday and I scheduled my annual mammogram too. I still haven't made it to the place where I'm to be fitted for a different type of foot brace. Considering what's going on with my balance and the audible clicking my hip makes when I'm going down a stairway, I'm wondering if I should see my doctor before I spend the money on the brace. For fear I won't need that expensive appliance, I'll need something else. In more personally satisfying news, I finished another eleven cat beds to donate somewhere. Two of these I'm saving for MCFC, so I'm inclined to hang on to the other nine until the con and just make more to donate to the local rescues. Not that I wouldn't be making cat beds anyway; even with the biking and the other crap I do after work during the week, I'm still trying to turn out one or two beds each week. This entry was originally posted at https://mrs-sweetpeach.dreamwidth.org/949670.html.